Saint Davids Fire And Security can Install, maintain and repair an extensive range of Intruder alarm systems to suit your needs in domestic, commercial or industrial environments. Intruder alarms are the basis of most building security systems and are fitted as standard in almost all commercial and industrial premises for good reason. The cost to have an Intruder alarm installed can be a fraction of the cost to replace damaged or stolen property or items from your home or business, not to mention the peace of mind you will have knowing your family and loved ones are safe. All systems can be remotely monitored and any problems or activations dealt with and reported to your choice of key holder(s). 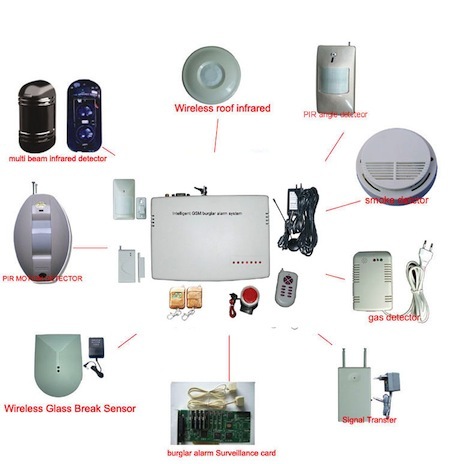 Wireless alarm systems are becoming more and more popular especially in domestic properties due to the ease of installation and no cables involved. Wireless technology has improved greatly in recent years and some systems are even recognised as grade 2 installations, which is the normal grade required for most homes. Some of the systems we are highly experienced with are Galaxy, Menvier, Scantronic, ADE, Europlex, Gardtec, Guardall, Texecom, Ademco, Aritech, Castle, C&K, Infinite and Visonic. Although we are able to install or maintain any alarm system as required. Intruder alarms usually reduce the cost of your building insurance and prices start from £400, this is not always recommended. Please contact us for further assistance or if you require a tailored quote to suit your requirements. Copyright ©2016 Saint Davids Fire. All Rights Reserved.